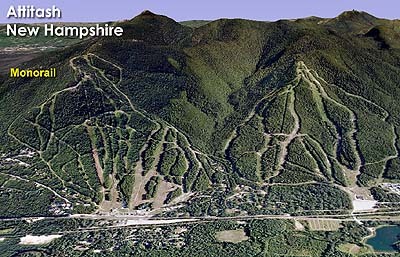 With competing areas featuring unique lifts (such as Cranmore's Skimobile, Wildcat's gondola, and Cannon's tramway), the new Attitash "red carpet" ski area was looking for a new and innovative form of uphill transportation to help open its upper mountain. 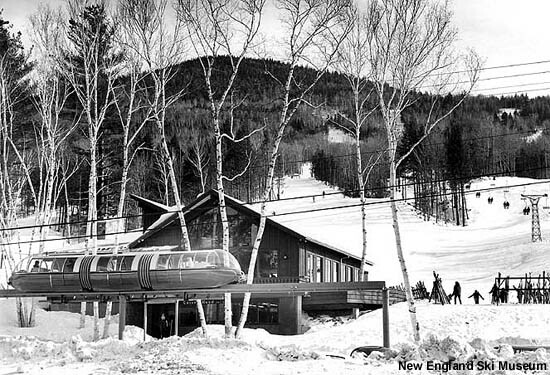 Plans were put together to build a heated cog monorail from the base lodge to near the present day ski area summit, a vertical increase of over 600 feet over the original 1965 development. The lift line was cut and a demonstration unit and 1,000 feet of track constructed adjacent to the base lodge. The monorail was expected to be over 7,000 feet long, with a train-passing-siding about halfway up. Six heated four-car trains were proposed. The installation of an upper mountain double chairlift in 1968 indicated a change in direction. At this point, the monorail proposal was still on the table, and was to be tied in with a massive housing development. 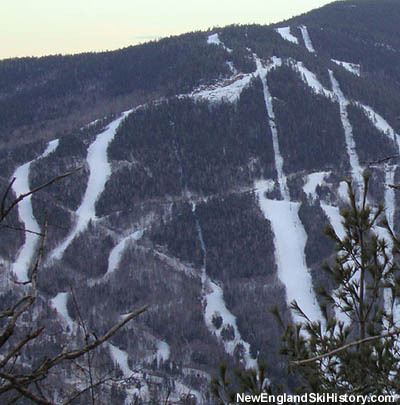 The proposed monorail was increased to 4 miles in length and was to cross over Attitash, West Moat, and Rogers Mountain. The proposal was eventually deemed impractical.